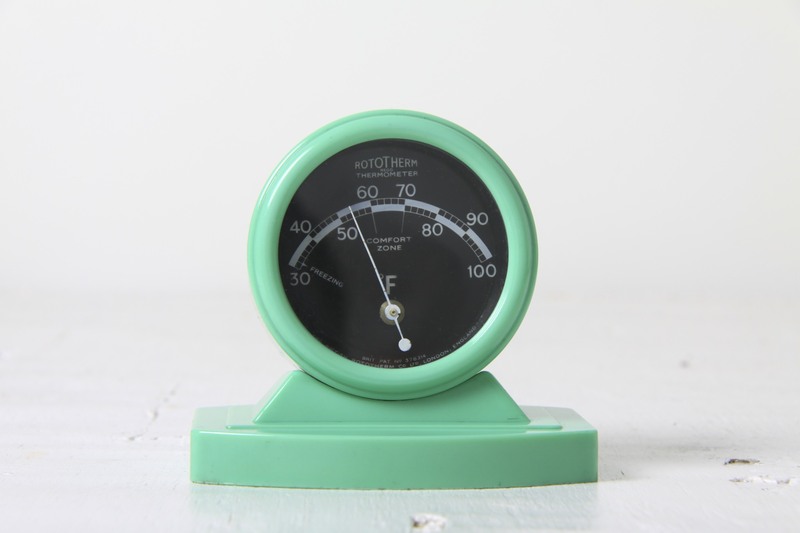 This is a fantastic green Bakelite / urea formaldehyde plastic desk top thermometer, made by Rototherm, England circa 1930’s. 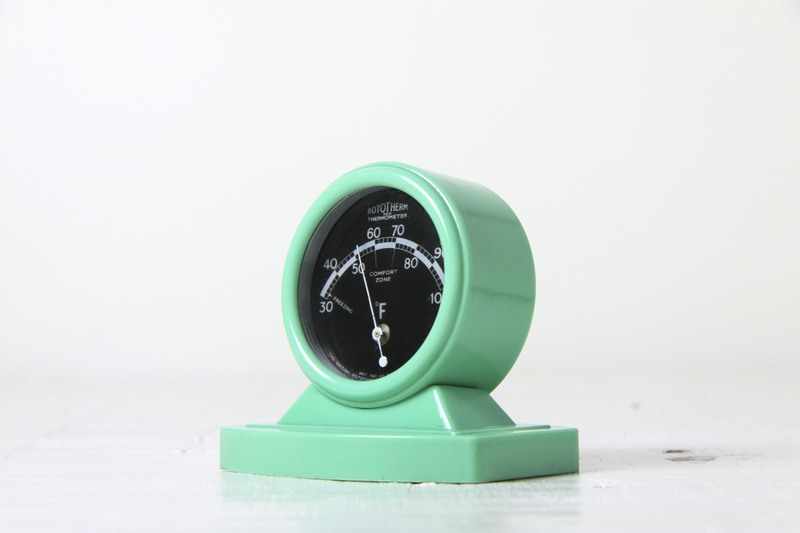 Stunning colour, made from the early plastic urea-formaldehyde, very similar in appearance and often mistaken for Bakelite, but in a far more vibrant colour than Bakelite could be made in, a beautiful turquoise / jade green, so reminiscent of the 1930’s era. Wonderful art deco / modernist / machine age form, the circular dial sitting on a raised stepped plinth, with fantastic curves and angles. The dial is in black with white scale and hand, making it very graphic and easy to read. The temperature scale is in Fahrenheit and shows the optimal ‘comfort zone’ ! A lovely rare collectable piece that is so reminiscent of the era and perfectly exemplifies the use of new materials and Art Deco / Modernist design during the 1930’s. Would make a great addition to any collection of Bakelite / early plastic items, and would complement any retro, vintage, 1930’s-50’s, modernist, minimalist or contemporary interior. Measures 10 x 10 x 7.5cm / 4 x 4 x 3in. In excellent condition, working and the back can be removed to adjust, no chips, cracks or scratches.